COTTON TREE, Cayo District, Thurs. 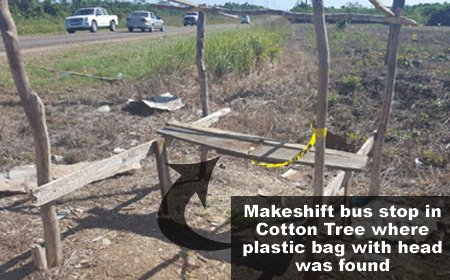 Nov. 30, 2017–Shortly after 6 o’clock Wednesday morning, a villager of Cotton Tree, on his way to work, came across a plastic bag near a makeshift bus stop in the village. Something about the bag must have made the man suspicious, and made him decide to open it and see what was inside. Inside the bag, the villager found himself staring at the head of a man, a fellow Cotton Tree resident, 56-year-old Hilton Wayne Wade. The police were alerted and they quickly arrived on the scene. After recovering the head of Wade, who police believe was killed that same morning, the officers visited an unfinished and unpainted cement bungalow house where the deceased had resided, about a quarter mile from the bus stop. Officers saw the structure on fire, and about twenty yards behind it they saw a body without a head. According to police sources, the body was observed with 28 stab wounds. The body and the head were later transported to the Western Regional Hospital, where a post-mortem examination is to be conducted. Today, the victim’s son, Hilton Wade, 32, provided an exclusive interview to the Amandala. According to the distraught son, he only learned of his father’s demise via the evening news. He expressed shock that his father had been killed so brutally. When our newspaper asked why anyone would want his father dead, Hilton, who hadn’t spoken to his father, who had been living in Cotton Tree, for the past seven years, had no clue. He recounted that his father was “a cool person, a friendly person, a peaceful man—only that he had a little issue in his head.” The son said that the deceased was an extreme Christian faithful who had wanted to own a piece of land. He had never had the opportunity to own a piece of land before, his son told us. A villager today told Amandala that the deceased would walk around the village loudly proclaiming that, “God gave him all the land.” According to the villager, the deceased was simply squatting on the property where his body was found and where he lived. The particular property, reportedly owned by an Asian national, had been the source of a dispute between the owner and the squatter, the deceased, who had reportedly expressed intentions of not leaving. Indeed, after Hurricane Earl wreaked havoc last August, the slain squatter had gotten assistance and made some improvements to the structure. 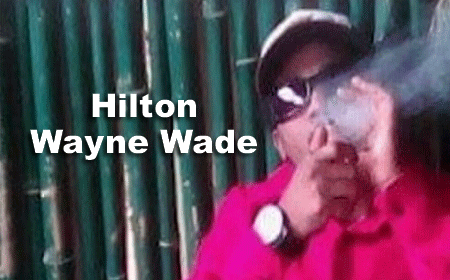 A police source told us that Wade had been to the Belmopan Police Station twice in respect to the ongoing dispute over the property. Assistant Superintendent of Police (ASP), Alejandro Cowo, in a press conference held today, revealed that one person has been detained by Roaring Creek police in connection with the beheading of Wade. A search of this person’s home led to the discovery of some effects linking him to the crime, Cowo said, but he would not share further details. Amandala understands that the suspect is a short, thin, Hispanic man who similarly resides in Cotton Tree. The beheading of Wade, a father of two, has occurred 16 months after the death of Pastor Llewelyn “Lue” Lucas, 47, who suffered a similarly horrible fate last July, 2016. His head was found in a bucket in a vehicle parked at a bar in Belmopan. The rest of his body was believed to have been a headless corpse which was found burned on a ranch near La Democracia, at Mile 31 on the George Price Highway.